Posted by Steven Bartus in Quick Eats, Street Food, Turkish Cuisine. Street food in Ankara has this interesting tendency to be prepared in the back of modified vans. Earlier in the year I profiled two of these vehicular eateries that dish out some exceptional köfte. Little did I know, though, that another great option is located almost within eyeshot of my lojman window. Just before the gate to the east campus of Bilkent University (my employer), Abi Esat parks his van and on most nights cooks up a variety of quick eats that are renown throughout Ankara. People drive from all over the city to sample his goods, and it is without a doubt worth the trip. Like the other vehicles I wrote about, Esat’s köfte is particularly good. The seasoning and toppings strike a near-perfect mix that provoke groans of satisfaction after the first bite. Combined with the option for melted kaşar on top, it might be the best I’ve encountered. However, Esat’s star attraction is his antrikot. Dervied from the French word entrecôte, meaning ‘between the ribs’, this premium cut of beef is an uncommon offering in the form of street food and makes for a highly delectable treat. Be sure to ask for it with cheese for some added flavor. To reach Esat’s van, take Bilkent 1. Cad. to 9. Cad. and look to the right shortly before the campus entrance (Google Maps). He’s usually around most nights after 20:00 or 21:00 and stays open until late. Köfte is priced at 5TL ($3.20 at 1.55TL/$), while the antrikot is a bit more pricy at 10TL ($6.45). There is also self-service midye available for 0.50TL ($0.30) each. When I think about the foods I’ll miss most when I leave Turkey, kokoreç and midye rank at the top of the list. Far too often foreigners and Turks alike foolishly balk at eating these delectable dishes, fretting over their purported uncleanliness or mildly suspect preparation. So what, I say, if kokoreç is spiced lamb guts or if midye absorbs heavy metals from seawater? They’re both delicious and simply must not be missed during any trip to this country. There is no shortage of places in Ankara to consume kokoreç and midye. I previously wrote about Şampiyon Kokoreç on this blog. But if you’re looking for something better than what is prevalent on the streets of Kızılay, I’d check out Kıtır. With an atmosphere somewhere between a saloon and roadside diner, Kıtır departs from the Ankara norm of tiled floors, florescent lighting and Atatürk pictures. The worn-in wooden tables and blaring 80s hair metal give off a decidedly cool vibe, a feeling too often absent in this city’s restaurants. I immediately felt like Kıtır was the type of place where I’d like to spend an evening casually eating and drinking with friends. The food at Kıtır is served cafeteria style; you order from a window by the door and give a colored token indicating your selection to the men behind the counter. Draft beer and other drinks are served at the end of the line. Kıtır’s kokoreç struck me as having a better balance of spices than most other offerings I’ve encountered in Ankara. It also had the correct consistency: chopped finely enough to prevent the meat from being too chewy while still allowing the unique flavor to come through. A final dab of the bread in the grease on the grill didn’t hurt either. Midye dolma lovers can get their fix at Kıtır, but definitely try the fried version as well. Served crisp and hot from the frier, these midye tava are accompanied by a tasty tartar-like sauce, something that brought me back to my summers spent on Cape Cod, Massachusetts. Finally, if you find yourself craving Turkish baked potato, Kıtır makes a very respectable kumpir. 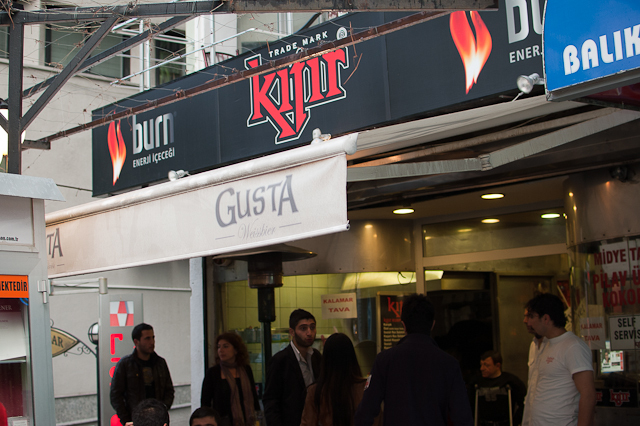 Kıtır has two locations in Ankara, one on Park Cad. in Çayyolu and the other at the end of Tunalı Hilmi Cad. in Kavaklıdere (Google Maps). My dining experience is based on the latter location. Prices at Kıtır are a bit higher than other places offering similar fare. A portion of kokoreç is priced at 10TL ($6.75 at 1.49TL/$), while one of midye tava comes in at 8TL ($5.40). Kumpir averages around 7TL ($4.70) depending on your toppings.